Novac plans on making sure people don't just think of phone calls when they think of Skype. Using the video conferencing functionality of Skype, Novac has come up with a piece of software that lets you transmit TV over Skype. By plugging in a USB TV tuner into your PC (yes, PC. Apparently, Novac hates people with Macs.) and using their secret sauce, Novac promises that you'll be able to watch your TV from anywhere in the world, so long as there's a Internet-connected PC with Skype installed. You're even able to remotely change the channel. Think of all the possible pranking opportunities that materialize with the ability to remotely change the channel. Of course, Novac isn't the only company to come up with a "place shifitng" solution. However, most of the others are hardware-based. 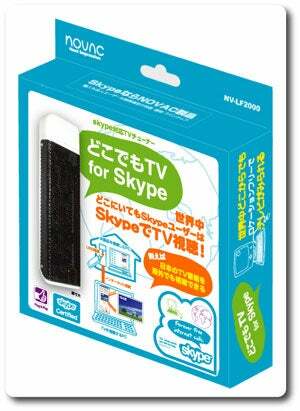 Novac's Skype TV goes on sale in Japan on July 14 for about $85.99.